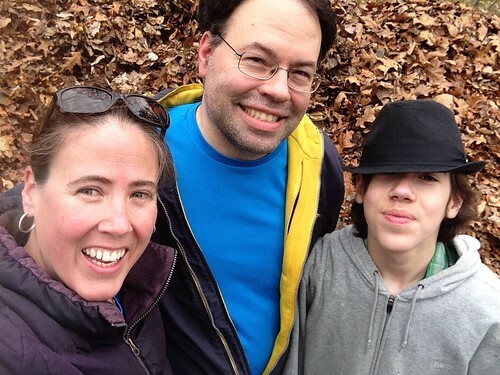 Team Stimey spent a chunk of the weekend raking leaves. And by "Team Stimey," I mean Alex, Sam, and I. The other two showed themselves to be far too unmotivated to participate so they escaped this particular fate. My family operates on a "prove yourself to be incompetent and you no longer have to do the chore" system. It is inefficient. 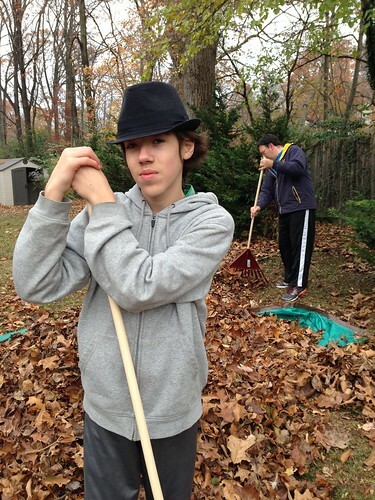 You may notice that Sam's jazz band hat is also a leaf raking hat. 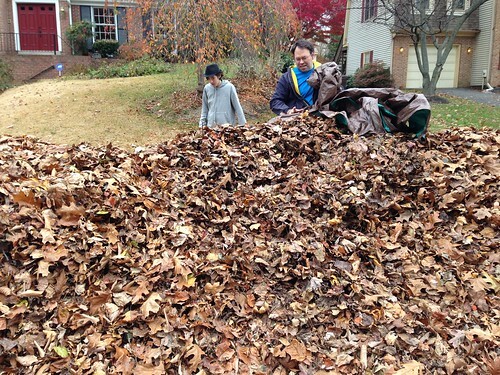 I bring up the leaf raking for a couple of reasons. First of all, there were some fun things that happened during said leaf raking and I thought I would share them with you. Also, we won our street's leaf raking and I wanted to brag about it. Our neighbors didn’t know that they were involved in a Leaf Off, but we did and that is what matters. I don't know why we moved into a house with so many stupid trees in the yard, but we did, and now we are paying the price. So. Many. Leaves. DROP YOUR STUPID LEAVES ALREADY, TREE! I'm looking forward to all of the tracking in of leaves once that tree up there finally drops its leaves right next to our back door in, you know, December. Or January. ENOUGH ALREADY, TREE. WHY ARE YOU HOLDING ON SO HARD? I tried to avoid leaf raking and hang inside with Quinn and Jack, but Alex used his patented mix of guilt, exasperation, and annoyance to get me outside with a rake in my hands. 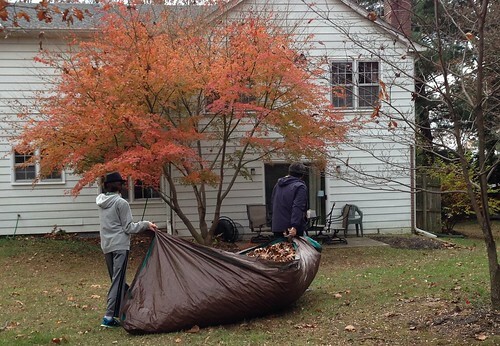 He then spent a lot of time telling me about how his way to rake and transport leaves was correct and mine was not and, "Let's just do it right the first time and then we don't have to re-rake up all the leaves." It was très annoying—especially when he was right. 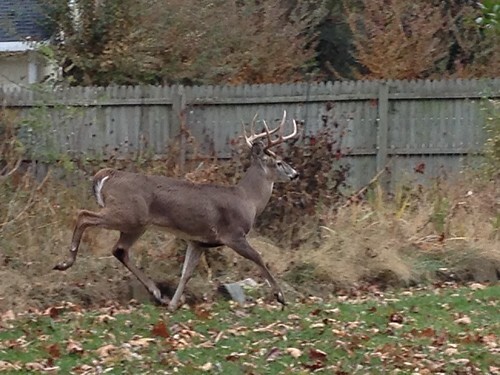 I watched one of our cats see this guy the last time he was in our yard. 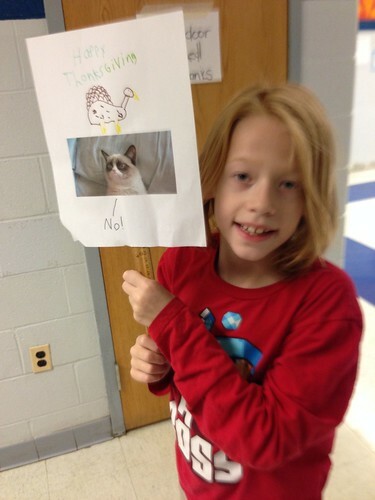 Her little cat eyeballs almost popped out of her head. I also got to do things like distract Sam and generally be a nuisance while Alex steadfastly did things. At least he could take comfort in the knowledge that he was doing it right. At some point—because Alex had to be somewhere, not because we ran out of leaves, we'll never run out of leaves—we made a decision to be done. 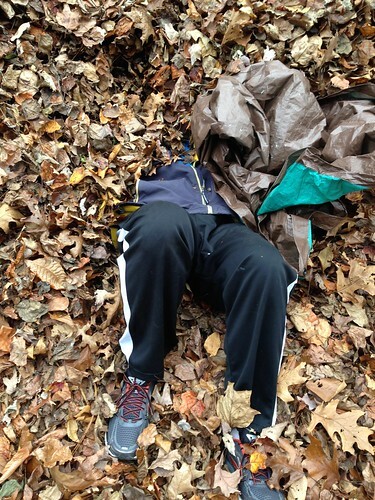 Then I shoved Alex in the pile of leaves. Then Sam and Alex got this...look in their eyes and I started running and screaming because I know it is funny to throw people into a pile of leaves, but it is NOT funny to be thrown in a pile of leaves because DO YOU HAVE ANY IDEA HOW MANY SPIDERS ARE PROBABLY IN THERE?! 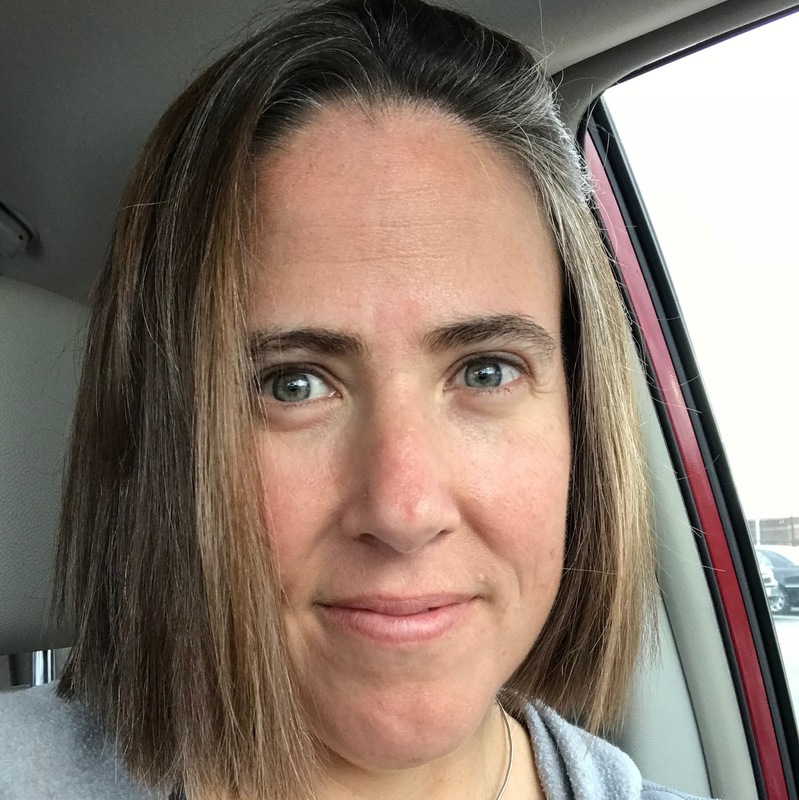 so I tried to sprint through the garage door into the house, but they caught me and they didn't listen when I told them, "No. Really. I'm serious about this. I don't want to be thrown into the pile of leaves. I really, really don't," but this came out sounding more like a high-pitched screech that turned out to be surprisingly ineffectual. 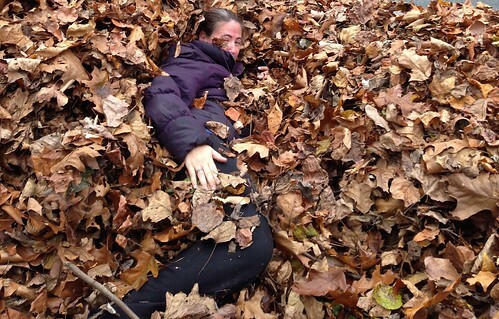 And then they threw me in a pile of leaves. I’m pretty sure the spiders laid their eggs in my hair. * Kidding. But wouldn't that have its charms? 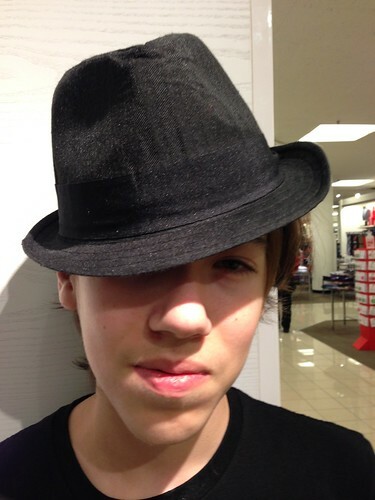 I bought Sam a hat this weekend for him to wear at jazz band concerts. 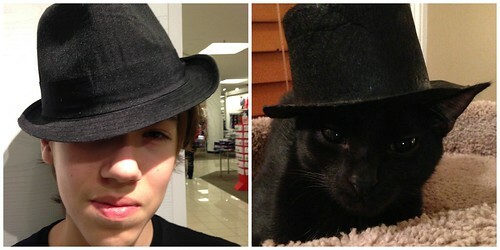 Then I realized that the thing where people start to look like their cats was happening.